Italians say that someone who acquires a new language possesses it. In my case, Italian possesses me. With Italian racing like blood through my veins, I do indeed see with different eyes, hear with different ears, and drink in the world with all my sensesA celebration of the language and culture of Italy, La Bella Lingua is the story of how a language shaped a nation, told against the backdrop of … one womans personal quest to speak fluent Italian.For anyone who has been to Italy, the fantasy of living the Italian life is powerfully seductive. But to truly become Italian, one must learn the language. This is how Dianne Hales began her journey. In La Bella Lingua, she brings the story of her decades-long experience with the the worlds most loved and lovable language together with explorations of Italys history, literature, art, music, movies, lifestyle, and food in a true opera amorosaa labor of her love of Italy.Throughout her first excursion in Italywith non parlo Italiano as her only Italian phraseDianne delighted in the beauty of what she saw but craved comprehension of what she heard. And so she chose to inhabit the language. Over more than twenty-five years she has studied Italian in every way possible: through Berlitz, books, CDs, podcasts, private tutorials and conversation groups, and, most importantly, large blocks of time in Italy. In the process she found that Italian became not just a passion and a pleasure, but a passport into Italys storia and its very soul. She offers charming insights into what makes Italian the most emotionally expressive of languages, from how the pronto (Ready!) Italians say when they answer the telephone conveys a sense of something coming alive, to how even ordinary things such as a towel (asciugamano) or handkerchief (fazzoletto) sound better in Italian. She invites readers to join her as she traces the evolution of Italian in the zesty graffiti on the walls of Pompeii, in Dantes incandescent cantos, and in Boccaccios bawdy Decameron. She portrays how social graces remain woven into the fabric of Italian: even the chipper ciao, which does double duty as hi and bye, reflects centuries of bella figura. And she exalts the glories of Italys food and its rich and often uproarious gastronomic language: Italians deftly describe someone uptight as a baccala (dried cod), a busybody who noses into everything as a prezzemolo (parsley), a worthless or banal movie as a polpettone (large meatball). 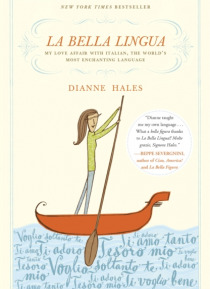 Like Dianne, readers of La Bella Lingua will find themselves innamorata, enchanted, by Italian, fascinated by its saga, tantalized by its adventures, addicted to its sound, and ever eager to spend more time in its company.